‘World leading quality customer service’ – it’s a claim often made but one which is often difficult to substantiate. And yet, when Auckland’s Andrew Simms Botany asserts that it offers such levels of service, the dealership now has a title to prove it! 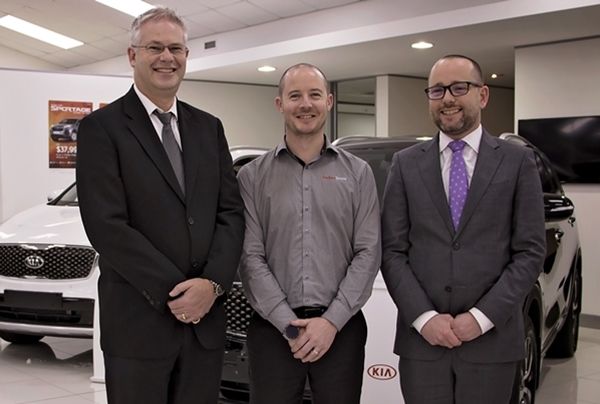 And yet, despite finishing first in the Asia/Pacific region and 11th overall at the recent Kia Service Advisor Skills World Cup in Seoul, senior service advisor, Travis Cross is as humble as they come. Travis earned his ticket to Korea after claiming top spot at the national finals in May. In Seoul, the competition comprised a written test, as well as a video scenario and role play, both designed to replicate customer experiences. “You can always study for the written test but we were thrown in at the deep end with the role play. We were given a time frame in which to ensure the customer walked away happy but not a lot of information; I felt a bit like a possum caught in the headlights! While Mr Cross may care for Kia customers, at home it’s a German engine which spins his wheels. He says there’s no particular secret to his success; there is only one way to reap rewards in any trade. As a result of this approach, Travis is on the move, promoted to service manager at Andrew Simms’ Newmarket dealership, but he doubts he will compete in Korea again. “More than likely [Kia New Zealand] will want to send someone new next time. It’s obviously nice to do so well, but it’s really more about exposing [contestants] to the experience, giving them opportunity to see where the brand comes from,” he says.